Leadership poems can be powerful tools that leaders can leverage to drive home critical leadership messages. Poems, used similar to how you might sprinkle in a motivational quote or two into your next presentation, can make a powerful impact and add additional value to your team. Great leaders use every tool at their disposal to empower, inspire, ignite emotion, and create positive change in the heart and mind of the reader. Dr. Martin Luther King once said that power is the ability to achieve purpose. Therefore the poet has a huge responsibility when it comes to the choice of the words she uses. Everyone has in them the ability to be a poet since all of us are born with the ability to be truthful. The primary role of the poet is to be honest. The goal of the poet is make others think inwardly. As a result, there is not much difference between a poet and a leader since both demand truth and thoughtful action. "One can only agree that when the skillful poet tells the truth, he often speaks the words that we recognize as our own." We have compiled a collection of fun and meaningful leadership poems, with the purpose of providing you with thoughtful tools and lessons that promote positive change. It would certainly be interesting to know how many inspiring poems have made a meaningful difference in a person's life; halted a suicide attempt; rescued a failing relationship, or provided the necessary push for a person to take action and overcome obstacles. When everything else goes wrong. 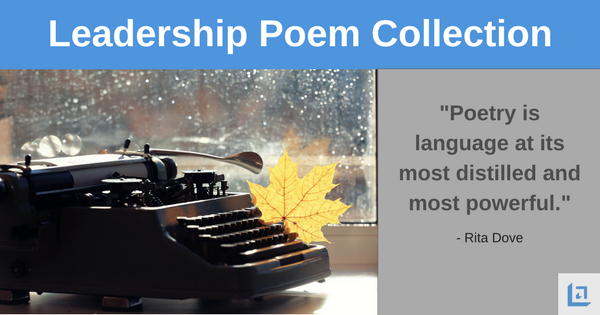 The following is a collection of leadership poems from a variety of leadership poets that we believe offer insightful lessons on life and the art of leadership. We have identified a leadership trait that can be supported by each selected poem. Think about how you might incorporate these poems into your next staff meeting or presentation and determine how poems can be another kind of leadership development tool for your team. Enjoy. Jest appearin’ ‘s’tho yew’re beaten? Fer yew t’ dew yer solemn dewty. An’ grin ‘n’ jest keep on a fishin’. An’ yew humps right down ‘n’ goes t’ wishin’. Jest try agin ‘n’ try t’morrow. Jest grin ‘n’ keep right on a fishin’. In settin’ down ‘n’ jest o’ wishin’. Thet other folks around are gittin’. Yer neighbor got his basket full! ‘Fore yew was up, ‘n’ kept a tryin’? An’ poke around a jest a wishin’. Thet’s shinin’ in that pool so shady. An’ now’s yer chance! Throw in yer hook! An’ grin ‘bn’ jest keep on a fishin’. ‘F yew hang right on ‘n’ keep a fishin’. It’s better ‘n’ t’ only keep a wishin’. An nothin’ doin’ on th’ bank. Yew git some good fer jest a tryin’. Let the fool prate of luck. Who by a life heroic conquers fate. Yes, to this thought I hold with firm persistence; The last result of wisdom stamps it true: He only earns his freedom and existence Who daily conquers them anew. Instead of sitting ‘round so sour and glum? When troubles come, I say, why don’t you laugh? O’er which you’ll have to jump. Why don’t you laugh? Just milk another cow! Why don’t you laugh? Come on, let’s all join in! Why don’t you laugh? That takes the pains to win it. Are the things that haven’t happened yet. And if sweet, we must make it sweeter. And leaves his drift among my temple locks. And found, too late, that I had hated wrong. Hate comes but when acquaintance is too brief. God knows him through and through – yet loves him still. Till the wall is overthrown. Whatever you do in life, keep in an ambition – arousing atmosphere. Who are anxious to do something in the world. You will catch the spirit of your environment. Who fought many batles at home and abroad. Was the conquest of self in the battle of sin. Shall bear rich harvest through immortal years. How much I could do if I only tried. When you think you’re beaten, you are. When you think you dare not, you don’t. It is a sure thing that you won’t. When you think you’re outclassed, you are. Before you can win a great prize. The prize is for believing. And what I ought to do, by the grace of God, I will do. I will do more than belong...I will participate. I will do more than care...I will help. I will do more than believe...I will practice. I will do more than be fair...I will be kind. I will do more than dream...I will work. I will do more than teach...I will inspire. I will do more than earn...I will enrich. I will do more than give...I will serve. I will do more than live...I will grow. I will do more than talk...I will act. I will be more than good...I will be good for something. Thanks for visiting our Leadership Poem Collection - we hope you've enjoyed the poems we chose for your consideration. Do you want to view some additional selections? Check out our encore collection of leadership poems.